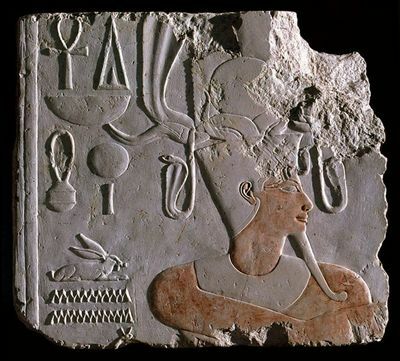 This fragments comes from a wall relief in the mortuary temple of Hatshepsut at Deir el-Bahari. A king is depicted wearing a splendid composite crown, which is probably the so-called feather crown composed of two tall ostrich feathers. Only the serrated outlines of the feathers have been preserved in the relief. The feathers are set on a pair of massive ram's horns with a solar disk and a pair of smaller bull's horns attached to them. Two upright cobras appear on either side of the feathers; their heads are now missing. Two smaller cobras are appended from the horns. The king has the uraeus on his forehead. His ceremonial beard has a small curve at the tip, and he wears a broad collar without any details.
" ... given life like Re, may he endure (at the head of the kas of all living beings [...])"
Steindorff, G., Die Blütezeit des Pharaonenreichs (Monographien zur Weltgeschichte 10), Bielefeld; Leipzig 1900, Abb. 17 (noch in situ photographiert). Porter, B. & Moss, R.L.B., Topographical Bibliography of Ancient Egyptian Hieroglyphic Texts, Reliefs, and Paintings, vol. II² : Theban temples, Oxford 1972, S. 355 (falsche Zuordnung). Kayser, H., Die ägyptischen Altertümer im Roemer-Pelizaeus-Museum in Hildesheim, Hildesheim 1973, S. 69, Abb. 43. Echnaton - Nofretete - Tutanchamun, Hildesheim 1976, Kat.-Nr. 73. Götter und Pharaonen, Hildesheim 1979, Kat.-Nr. 182. Karkowski, J., Deir el-Bahari 1974-1975 : Travaux égyptologiques, in: Études et Travaux 11, Warszawa 1979, S. 217-220 (S. 218-220, Fig. 1). Seipel, W., Bilder für die Ewigkeit : 3000 Jahre ägyptischer Kunst, Konstanz 1983, Kat.-Nr. 64. Eggebrecht, A. (Hrsg. ), Ägyptens Aufstieg zur Weltmacht, Hildesheim - Mainz 1987, Kat.-Nr. 12. Seipel, W., Ägypten : Götter, Gräber und die Kunst; 4000 Jahre Jenseitsglaube, Linz 1989, Kat.-Nr. 428. Eggebrecht, A. (Hrsg. ), Pelizaeus-Museum Hildesheim : Die ägyptische Sammlung, Hildesheim - Mainz 1993, Abb. 41.